Offering a service to repair and refurbish vehicle remotes can add an additional service and valuable income to your current business. Car remotes are very expensive and often fail for simple reasons such as broken casing, worn rubbers, failed switches or just a flat battery. The Key and Remote Repair Service package offers everything required to start a comprehensive repair and refurbish service. This course is ideal for key cutting shops, garages and locksmiths that want to offer a repair service for vehicle keys and remotes. Whether you currently offer vehicle key cloning, key programming or neither, offering repairs to car keys and remotes can be lucrative to your business and an ideal addition to your current service. As this course meets the needs of the key cutting shops, cobblers shops, ironmongers and other shops that often get the opportunity to offer key & remote service, this course runs on the same day as the Key Cloning Silca RW4+ & ID48 course, and if booked together will be discounted by £25.00. Buy a complete repair solution, including the above training, at an extra special price. The Key and Remote Repair Kit includes a comprehensive tool kit to carry out the stripping, test and repair of the majority of remotes. 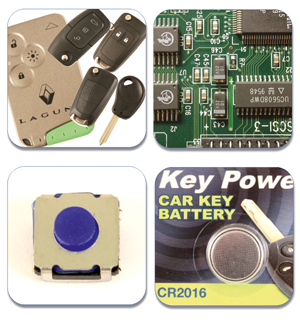 Included in the kit is a starter pack of batteries, remote shells, buttons, switches and key blades to cover a huge range of vehicle remotes.